There's something oddly remote about Every Day, which plays like a double-wide version of a perfectly acceptable Showtime pilot. 90 min. Image Entertainment. Director: Richard Levine. Cast: Liev Schreiber, Helen Hunt, Carla Gugino, Eddie Izzard, Brian Dennehy. 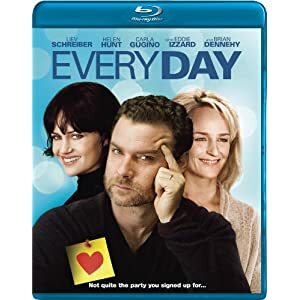 Richard Levine's semi-autobiographical feature directing debut announces its intentions in that title: an "everyday" look at a modern American family. The problems facing father Ned (Liev Schreiber) and mother Jeannie (Helen Hunt) are familiar ones: a marriage threatening to lose its spark for good, discomfort over a (gay) son's adolescent sexual stirrings, and the challenge of dealing with Jeannie's ailing, ornery father. While these are inherently relatable problems, there's something oddly remote about Every Day, which plays like a double-wide version of a perfectly acceptable Showtime pilot. The TV feel probably owes to Levine's years in the trenches of Ryan Murphy's Nip/Tuck, parodied here as TV writer Ned's workplace: the melodrama "Mercy Medical." Eddie Izzard plays Murphy surrogate Garrett, a blithe provocateur who puts it plainly: "We have five shocking moments in every script...Shock me." Every Day is, of course, antithetical to this kind of in-your-face approach. If it were indeed a TV show, I'd no doubt tune in, to revel in the fine cast and explore the deeper nuances of the characters. But Every Day isn't a TV series, so it must hasten to serve all of the characters in a rushed 92 minutes that leave a viewer pretty much unmoved. It's a bit like having one of those "single-serving" friendships the narrator of Fight Club described having on airplanes, the new friend pretty much forgotten within a day. And so it goes: as young son Ethan (Skyler Fortgang) watches with mildly growing dread, Jeannie troubleshoots the arrival in their home of sick, depressed, angry Grandpa Ernie (Brian Dennehy). “I don’t even like him,” Hunt confesses in a moment of weakness, though she learns to appreciate the source of his pain and forgive it. Her weariness after nineteen years of marriage makes it easier for Ned to consider infidelity with his eager co-worker Robin (Carla Gugino), though that plot point ends up half-baked at best as Ned rushes to his lesson about what he wants in life. Similarly rushed is the "week in the life" look at the burgeoning dating life of teenage son Jonah (Ezra Miller, even better here than in City Island), which presses buttons with his loving but still uncomfortable father. Every Day benefits most from the chops of its cast and some snappy dialogue, but the latter borders on sitcomedic and the drama never quite finds the well-rounded shape of a feature that will stand time's test. Shot on digital, Every Day makes an easy transfer to hi-def Blu-ray. Though the image doesn't exactly leap off the screen, it's a solid rendering of the indie's subdued visual scheme: colors (including flesh tones) appear accurate, detail is palpable, but contrast runs a bit wan. The film gets the full DTS-HD Master Audio 5.1 surround mix treatment, though the rear channels aren't worked hard: it's a fairly front-heavy mix prioritizing (as it should) dialogue. The film's “Trailer” (2:30, SD) is among the handful of extras. A Cast Interviews and Deleted Scenes section includes “Cast Interview” (14:12, SD)—individual interview clips of Richard Levine, Carla Gugino, Ezra Miller, Brian Dennehy, Liev Schreiber, Helen Hunt, producer Miranda Bailey, and Eddie Izzard—and seven deleted scenes: “New Bed” (:51, SD), “Typical School Day” (1:34, SD), “Ethan Gets Tucked In” (1:38, SD), “Ned and Jeanie Share a Moment” (1:00, SD), “Ernie the Philosopher” (1:01, SD), “Handball” (:43, SD) and “They Say It on T.V.” (1:14, SD). Since it's available at a "nice price," Blu-ray is surely the way to go for fans of the cast and the film. All site content © 2000-2019 Peter Canavese. Page generated at 04/18/2019 02:52:20AM.